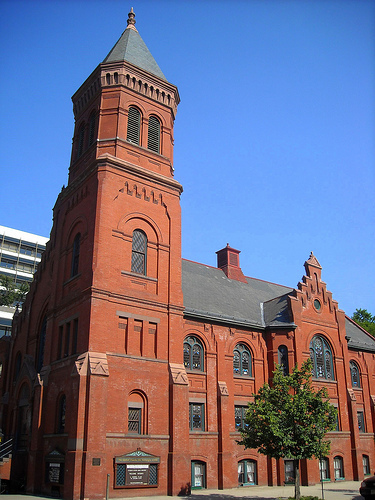 Come to observe the significance of the Leipzig Monday Demonstrations at the Vereinigte Kirche located at 1920 G. St. NW in Washington, DC! 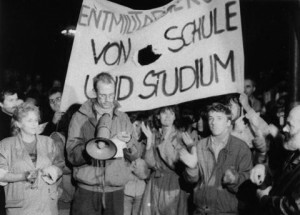 Events will consist of a short video of the events of 1989/90 along with reflections by former East Germans living in the D.C. area. A procession to the Smith Hall of Art (GWU) with banners made by GU and GWU students will follow for the opening of a photo exhibit “Berlin Walls” by Bruce Blundell. Reception to follow. Ex-GDR citizen Dr. Otto Skrodt is about to become an important politician in Bonn when his old friend Karl shows up to ask him for financial help. Karl had been imprisoned in the GDR because of a denunciation of Otto who was an IM for the Staatssicherheit. Otto believes that Karl found out that he was the IM and that he will blackmail him for that. Before the collapse of the Berlin Wall, East Germany’s population was closely monitored bythe State Secret Police or Stasi. Only a few citizens above suspicion, like renowned pro-Socialist playwright George Dreyman, were permitted to lead private lives. 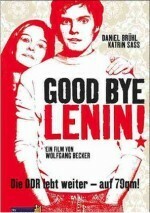 But when a corrupt government official falls for Georg’s actress-girlfriend, Christa, an ambitious Stasi officer is ordered to bug the writer’s apartment to gain incriminating evidence against the rival. What the officer discovers is about to dramatically change their lives – as well as his – in this political thriller and Academy award-winning film. What walls still exist in our world today? Come express your opinions by writing or drawing on our Berlin Wall Replica, located on the Red Square at GU! Join us on the Red Square to “tear down” the Wall by eating a slice of our large cake in the form of the Berlin Wall! Freedom never tasted so sweet. The German Department of Georgetown University is inviting students to take part in a journalistic competition. Between November 3 and November 17, Georgetown University and George Washington University will be hosting a series of events reflecting on and celebrating the 25th anniversary of the fall of the Berlin Wall. We are inviting students to submit journalistic interpretations of these events, which include for example a photo exhibit, a protest walk, a symposium, eyewitness accounts and a Wall replica, and much more. The journalistic interpretation is open to each student’s individual interests and abilities. Our main goal is to have contributions that reflect the overall tenor of the events and offer a critical perspective on the celebration in the USA of an event that was and is so important in German, European and world history. Requirements: You must attend at least 3 events in order to offer a broader perspective in your report. Submissions in English. Submissions due by November 26. Prizes to be awarded December 5th at the GU German Department Christmas party.